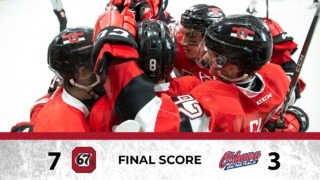 The hockey season is far from over for Ottawa 67’s captain Jake Middleton. A week after his OHL season came to its conclusion, Middleton has been signed to an Amateur Try-out Agreement by the Manchester Monarchs – affiliate of the LA Kings. He’ll join former 67 defenceman Alex Lintuniemi, who also joined the Monarchs on an ATO agreement after the OHL playoffs last sseaon. Middleton, 20, played in 68 games for the Ottawa 67’s (OHL) this season, recording 31 points on seven goals and 24 assists. The left-shot defenseman was drafted by the Los Angeles Kings in the 7th round (#210 overall) in the 2014 NHL Entry Draft. 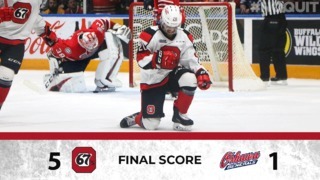 The 6-foot-3, 214-pound native of Stratford, Ontario played in 226 games over parts of four seasons in the OHL between the Owen Sound Attack and 67’s, and scored 86 points on 14 goals and 72 assists. 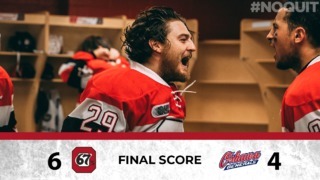 Middleton wore the “C” for the 67’s this season leading them to their second straight playoffs. Middleton makes his Monarchs debut tonight (7 p.m.) when the Monarchs host the Adirondack Thunder in the final home game of the regular season on Fan Appreciation Night.